This movement practice class will deepen our work as dance artists both physically and performatively. Infusing somatic inquiry and improvisational exploration alongside building specific alignment/coordination connections in movement organization, we'll engage in various practices that energize and attune ourselves, both individually and together, to the interconnected wholeness of our moving form and being. We'll transfer this physical research into the embodiment of complex and dynamic movement phrasing, eventually dancing this material within expansive performance propositions and scores as a culmination of our time together. We'll practice moving with clarity, connection, freedom, adaptability, and artistry, excavating a personal and collective presence in the moment of performance. Jake Meginsky collaborates sonically throughout the class experience! KATIE MARTIN (Festival Finale) is a choreographer, performer, teacher, and recipient of the national Jacob K. Javits Fellowship in Dance. She received a BA in Dance at Bennington College and a MFA in Dance as a Teaching Fellow at Smith College. She lives in Northampton, Massachusetts where she is a guest artist and dance faculty throughout the Five College Dance Department. ANGIE HAUSER (Improvisation Ensemble, Associate Professor of Dance and Department Chair at Smith College). She received her M.F.A. from Ohio State University and, since 2000, has been a member of the Bebe Miller Company and contributed to the company's award winning body of contemporary dance work. In 2006 she was awarded a BESSIE (N.Y. Dance and Performance Award) for Creation and Choreography for her work with Bebe Miller. SARAH ELIZABETH LASS (Festival Finale) is a Denver-raised, Northampton-based performer, dance maker, teacher, and writer. Her creative and scholarly research draws upon neurophysiology, somatics, philosophy, architecture and landscape studies, visual art and creative writing. Engaging her extensive study of improvisation, her most recent work centers around the concept of resonance, looking at the ecological, aesthetic, and imaginative conditions of experiences of illuminating coexistence. As a performer, Lass has worked with the Bebe Miller Company, Angie Hauser, Chris Aiken, Shayla V. Jenkins, Dante Brown/Warehouse Dance, Donnell Oakley, Shannon Gillen, and others. Her own choreography has been presented by the Smith College Department of Dance, Triskelion Arts, the ArtBark Collective, and others. She has presented her written research at a number of conferences, including the Dance Studies Association in 2017. Lass graduated from Smith College with an MFA in Dance in 2018 is currently teaches at Marlboro College and Keene State College. ANDREW PESTER (Festival Finale) is a dancer, improviser, and choreographer. Originally from Lawrence, Kansas, he graduated with a B.A. 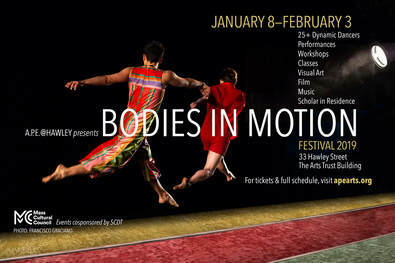 in Dance at Middlebury College in Vermont, and is currently working and creating in New York.